Registration has opened for the 2018 Berger Southwest Nationals at the Ben Avery Range in Phoenix, Arizona. This is a GREAT match, the best in the West by far. The match runs February 5-11, 2018. By all means, attend if you can. The Grand Agg filled up last year, so we recommend you register soon. Some shooters come to to the SW Nationals for the swag (the prize table is amazing). Others come for the sunshine (think warm 75-85° weather). And even more folks come to try out their shiny new toys and to test their skills against the nation’s best shooters. If you want to test your mettle against some of the best shooters in the world, get yourself to Ben Avery in February. Here you can compete, shoulder to shoulder, against the best Sling and F-Class shooters on the planet. Guys like Derek Rodgers (newly-crowned F-TR World Champion), John Whidden (reigning Long Range National Champion), Nancy Tompkins (the first women to win the National High Power Championship), and Kenny Adams (past World F-Open Class Champion). If you want to play in the Big Leagues, Ben Avery is the place. Having said that, novice shooters will enjoy the experience as well, because you’ll find that these top shooters are (almost universally) happy to share their knowledge. Just to whet your appetite, here are videos from recent Berger SW Nationals. Yes, this match is as much fun as it looks! The North-by-Southwest team set new National Records in winning the 2017 F-TR team event. The best minds of the shooting world come to Ben Avery every year. Got a question about ballistics? Well, Ballistics Guru Bryan Litz (photo below) will be happy to answer your questions between relays. Want some expert advice about wind reading? Seek out Mid Tompkins (usually found hanging around the club-house) or Emil Praslick, one of the most knowledgeable wind coaches on the planet. 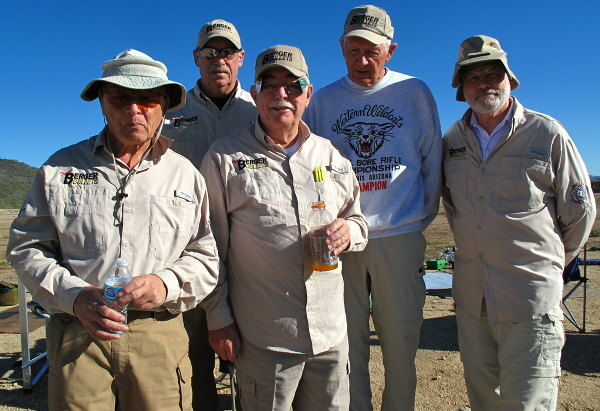 And if you have a gunsmithing question, you’ll find some of the top barrel-fitters and stock makers, including Doan Trevor and Gary Eliseo. 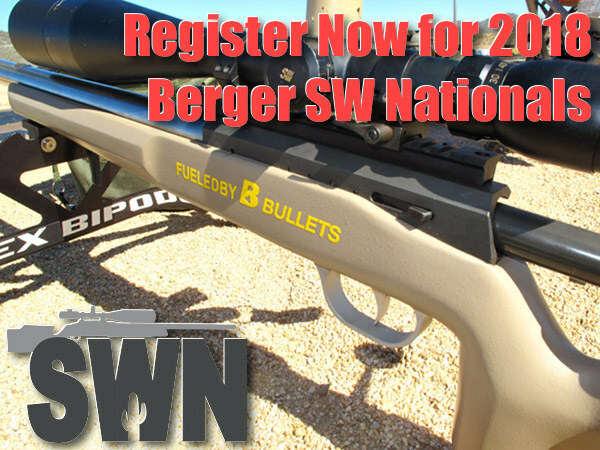 Share the post "Berger Southwest Nationals 2018 — Registration Opens"
What make/model action is that on the cover/logo picture rifle? RPA? The only way to accommodate all the would-be participants may be to separate the divisions into their own sets of dates. I won’t even pretend to be some kind of a champion…my buddy Todd and I went just to have fun competing, learn at the clinics, learn from watching and learn from just “hanging out with and watching some VERY GOOD shooters. Our only 2 goals were to NOT embarrass ourselves too badly and to HAVE FUN YAY!!! MISSION ACCOMPLISHED! This year we have the same two goal…only this time we are gonna shoot ALL WE CAN and NOT just the 600….Here we come again!!! Filled up in eleven hours, waiting list only now. I missed getting in last year by about fifteen minutes ,so I can empathize with those who didn’t make it this year . My first Berger , but won’t be my last . Doing the clinic , and mid-range only , and really looking forward to being there , and learning from the best .